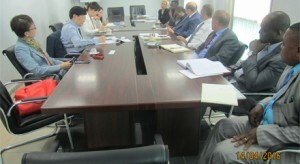 Algiers, Thursday 14 April 2016, a delegation from the Korean Ministry of Foreign Affairs led by the Deputy General Director of the African and Middle East Division, Mr. YEO Sung-Jun, was received in audience by the ACSRT Acting Director, Mr. Idriss Mounir LALLALI and other ACSRT staff members. The two sides discussed the rapid growth of terrorist groups, especially the so-called ISIS, and their impact on the Middle East, Africa and Europe. They shared ideas on the phenomenon of Foreign Terrorist Fighters (FTF) and the role of ISIS in the recruitment and training of Africans and Europeans. The discussion also touched on a wide range of issues relating to the prevention and combating of terrorism including the evolving nature of the threat and how important it is to adapt to these changes and develop adequate strategies to tackle its present forms and possible mutations, while emphasizing that a good insight into these changes may be instrumental for governments in identifying terrorists’ greatest vulnerabilities. The Head of the Korean delegation Mr. YEO Sung-Jun expressed his appreciation for the clear and helpful picture depicted by the ACSRT on the terrorism situation in Africa.